Our civilisation is built on oil. Every time we turn on a light or a television set, we are consuming oil. Every product in the supermarket arrives courtesy of oil. The packaging in which those products are sold is manufactured using oil. The out-of-season fresh fruit from the other side of the world is shipped in aircraft that fly on oil. Every ambulance and every hospital operating theatre runs on oil, so in a very real way, oil is the lifeblood of our world. Oil prices have been rising for some time. Between 2004 and the autumn of 2005, for instance, prices more than doubled, rising from US$30 to US$66. With businesses so dependent on oil and with such a large rise in its price, it isn’t surprising that the consumer is paying more for goods and services — from food to airline flights. There are several reasons for rising oil prices: demand is increasing steeply; the Organisation of Petroleum Exporting Countries (OPEC — which accounts for approximately 50 per cent of world production) is not adjusting output to meet demand; and there is a shortage of refining capacity. An additional problem is that the Middle East has the largest reserves and is the biggest producer of oil. (Saudi Arabia alone produces eight million barrels each day.) The disruption in Iraq and political and social problems in other Middle Eastern oil-producing countries cause prices to rise, as markets fear further supply interruptions and shortages. Additionally, countries like Brazil, India, and China are industrialising rapidly, and need more oil to do so. China’s car market alone is sucking in oil. A little more than five million cars were sold there in 2004 — and China’s motorists are by no means the country’s biggest users: the country’s industries are booming, and modern industries can only boom on the back of oil. In fact, China has become the second largest oil user (after the US), as the country moves ever closer to becoming the world’s largest economy. 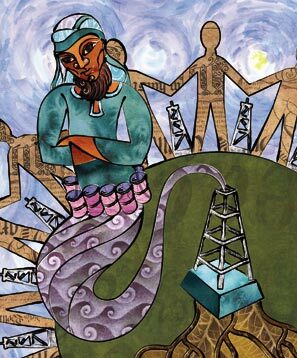 On top of an increase in demand and relatively static supplies came hurricanes Katrina and Rita, which tore through the Gulf of Mexico and disabled much of the United States’ important oil refining facilities. This meant that even if there were sufficient oil, we would probably not be able to refine enough of it to cover current demand. All of this is bad news for the world economy. It is even worse news for small and developing countries, like those in the Caribbean, whose financial resources are strapped even when times are good. A particular problem for almost all Caribbean countries is that they are dependent to an extraordinary degree on tourism. Tourism, certainly mass tourism, is only possible because of oil. Whether visitors come by plane or cruise ship, they cannot do it without oil. To cover the rising cost of oil, airlines and cruise ship operators must charge more — either with fuel surcharges or by simply increasing the price of a ticket or trip. A rise in the cost of long-distance travel acts as a brake on tourism, and fewer tourists mean difficult times for Caribbean economies. As well as being dependent on tourism for revenues, Caribbean countries are extremely dependent on imported goods; there is little manufacturing in the region. (The only really major extra-regional exporters of manufactured products are Trinidad and Tobago and Jamaica.) Additionally, domestic food production is limited, and not diverse enough to avoid the need to import food. These imported manufactured goods and foods are becoming more expensive — again because rising oil prices have made them more costly to produce and to transport. Conversely, Caribbean exports also suffer, because rising production and transport costs make them more expensive in overseas markets. The only significant oil and gas producer in the Caribbean itself is Trinidad and Tobago, the region’s energy and manufacturing powerhouse. According to the country’s energy ministry, “the energy sector is the mainstay of the economy” and contributed approximately 34.1 per cent to the country’s gross domestic product, 85.5 per cent to merchandise exports, and 37.1 per cent to government revenues in 2004. For Trinidad and Tobago itself, high oil prices do at least benefit the country’s revenues. For the other Caribbean countries there is no positive side. In the wider Caribbean region, Venezuela (with its Caribbean coast) is the largest producer. The country is a member of OPEC and has the sixth largest oil reserve of the producers’ group, estimated at 66 billion barrels. In June 2005 the president of Venezuela, Hugo Chavez, launched Petrocaribe, a scheme to sell the country’s oil directly to other Caribbean countries with low-interest financing and deferred payment. Many Caribbean territories have signed up to the scheme, with only two (at the time of writing), Barbados and Trinidad and Tobago, still considering their options. Wind and wave power and other “green” energy sources seem ever more attractive. While wind and wave power cannot be exported, biofuels can — and biofuel production is possible in some Caribbean territories because it can be produced from the very commodity on which the modern Caribbean was built: sugar. Biofuels produced from organic materials, including sugar, are very slowly, but surely, gaining favour with motor car manufacturers. Brazil, for instance, is already producing large quantities of biofuel for domestic use and the country’s roads are filling up with cars that can run on it. With foresight and planning, both of which seem to be abundant in countries like Guyana, the Caribbean’s most important sugar producer, there is no reason why the Caribbean should not do the same, and turn its sugar, a commodity of dwindling value on world markets, into a valuable foreign currency earner. Biofuels offer a real opportunity for the Caribbean to get an early lead in a new and growing industry. Whether or not oil supplies improve, prices are unlikely to fall in the longer term. There may or may not be enough oil reserves to keep us going for another fifty or hundred years, nobody really knows. There is great untapped potential in Africa, for instance. But given the expansion in demand, particularly from China, Brazil, India, and Russia, the price will continue rising, even if at a less dramatic rate than during the past eighteen months. Whatever happens, people and companies are beginning to realise they will need to invest in smart air-conditioning and lights that turn themselves off when the room is empty. We have to save oil. For the Caribbean, however, it is vital that there is enough fuel to support a global tourism industry. Without tourism, the Caribbean’s current problems would pale into insignificance.